At Synolos we can design and make something for every situation, if it be in the home, the garden, the office or a special occasion we can make that special item unique and personal. We design and make each piece by hand using a mixture of traditional and modern techniques within our Oxfordshire workshop. 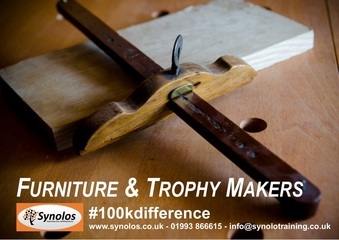 Synolos is an Award Winning Social Enterprise based in West Oxfordshire that helps individuals identify and realise their potential. We work hard to support individuals in the pursuit of improving their lives and building their futures. All income we make from any enterprise activity goes back into helping some of the most needy in society.